Title: The Surface of the Deep Author: Charles E. Winquist Philosophical and Cultural Studies in Religion Imprint: The Davies Group, Publishers soft cover 328 pp. 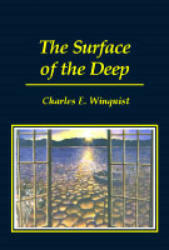 USD 25.00 ISBN 978-1888570700 2003 The Surface of the Deep is Charles Winquist’s final book and serves as the culmination of his work. Professor Winquist worked on The Surface of the Deep until shortly before his death on April 4, 2002. His intention was to provide a republication of his first book, The Transcendental Imagination, along with other essays written over the course of the last decade, in order to demonstrate how his theology had developed from its beginnings. This was to function as platform and prolegomenon to his future work. Deeply indebted to Paul Tillich’s philosophical theology of culture, Winquist also radicalized Tillich’s thought by completing the break with ecclesiastical theology. Like Tillich, Winquist worked on the edge of the most influential and important academic, philosophical, and theoretical discourses. At the same time, Winquist never lost touch with human and religious experience and was always sensitive to the constraints of and on theological thinking. Winquist developed a sophisticated methodology that situated theology in relation to the study of religion and within a thoroughly secular culture. Theology was a discourse formation that functioned to fissure other discourses by pushing them to their limits and interrogating them as to their sense and practicability. Contents Foreword Preface Part 1 A Preliminary Problematic Chapter 1 Introduction Chapter 2 An Epistemological Conception of the Transcendental Imagination Chapter 3 Transcendental Ontology Chapter 4 An Ontological Conception of the Transcendental Imagination Chapter 5 The Development of a Hermeneutical Theology Part II Theoretical Elaborations Chapter 6 The Surface of the Deep: Deconstruction in the Study of Religion Chapter 7 The Theological Becoming of Metaphysics Chapter 8 The Silence of the Real: Theology at the End of the Century Chapter 9 Theology and the Pedagogy of the Sacred Chapter 10 Person, Subjectivity, Self Chapter 11 The Ambiguous Gift of Desire Chapter 12 Thinking Religion Chapter 13 Materiality and Theoretical Reflection Chapter 14 Postmodern Secular Theology Part III Theological Filiations Chapter 15 Paul Tillich and Theology Beside Itself Chapter 16 Paul Tillich and Untimely History Chapter 17 Langdon Gilkey: Theology, Symbolism and Language Chapter 18 Analogy, Apology and the Imaginative Pluralism of David Tracy Chapter 19 Jacques Derrida and the Study of Religion Chapter 20 Julia Kristeva and Amatory Discourse Chapter 21 Hannah Arendt and the Banality of Evil Chapter 22 Jacques Lacan and Theology Reviews “From Whitehead and Tillich, and Kant and Lonergan, all the way to Deleuze and Derrida, from a transcendental interrogation of the intelligibility of being to a deconstructive desiring theology, The Surface of the Deep is the fascinating journey of Charles Winquist, one of twentieth-century American theology’s most brilliant and original minds. For Winquist, theology is always the disturbing disruptive voice that prevents our discourse from closing, that keeps thinking open to a desire for the other, to a desire beyond desire, for something we know not what that is lodged in the surface of the familiar and ordinary. An extraordinary pilgrimage, a sparkling mind.” —John D. Caputo “Charles Winquist’s The Surface of the Deep offers a posthumous challenge to scholars and philosophers of religion to continue to think religion through with a range and freedom that is supported by rigorous phenomenological method at its best. By honoring theology while making minimal truth-claims for its purchase on our disciplines, Winquist clears a space for attending to the surface as well as the deep structure of articulated spiritual experience, to its graininess, its style, its ethics and aesthetics, and to the desire for significance that will not allow us to rest in dogma, however much we recognize its pressure on what we say. Like his Desiring Theology, which has inspired many both inside and outside his own school of thought, this book makes sense, and makes sense with elegance and humanity.” — Cleo Kearns “For Charles Winquist, the only thinking that mattered was thinking that both expressed and provoked desire. Having fathomed the depths of desire, he resurfaced to bring us haunting letters whose messages are profoundly unsettling. The Surface of the Deep is the final trace of a remarkable voice that fell silent all too soon.” — Mark C. Taylor “The Surface of the Deep is a profound…thirty-year meditation on the most pressing concerns in the study of theology and philosophy in the last half of the twentieth century. Through these collected critical engagements with the major works of such figures as Immanuel Kant, G.W.F. Hegel, Friedrich Nietzsche, Sigmund Freud, A.N. Whitehead, Jacques Lacan, Gilles Deleuze, and Jacques Derrida, the writings of Charles E. Winquist reveal the genesis of a distinctive ‘postmodern theology’ as a recurring surface for theoretical thinking.” — Victor E. Taylor, author of Para/Inquiry: Postmodern Religion and Culture. About the Author Charles E. Winquist (Ph.D. University of Chicago, 1970) was Thomas J. Watson Professor of Religion at Syracuse University from 1986 until his death in 2002. He was a pioneer in postmodern, deconstructive theology and is a highly regarded theoretician of religion whose work is “constitutive of one of the more original sets of theological reflections of the late twentieth century.” (James J. DiCenso, University of Toronto). Among his publications are Desiring Theology (1995), Theology at the End of the Century (1990), Epiphanies of Darkness (1986, 1999), Practical Hermeneutics (1980), Homecoming (1978), Communion of Possibility (1975), and The Transcendental Imagination (1972).